In yesterday’s episode of Cosmic Disclosure, Corey Goode described the age regression and time travel technologies used for his “20 [years] and back” tour of duty in several secret space programs. He comprehensively detailed the process used as a standard operating procedure for the many thousands recruited into these programs, and then returned back to ‘normal’ civilian or military life at the time of their initial recruitment, with their memories wiped. His account was compared with another alleged secret space program whistleblower, Randy Cramer, who explained an almost identical age regression and time travel process to Goode’s. Cramer, like Goode, claims the processing happened to him in 2007 at a secret base on the Moon, called Lunar Operations Command. 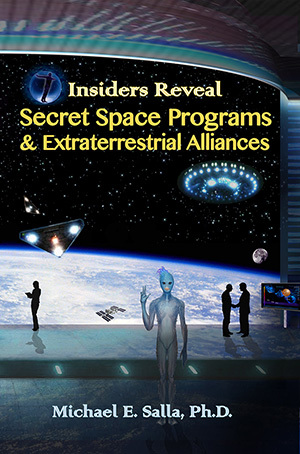 In the highly popular Insiders Reveal Secret Space Programs and Extraterrestrial Alliances, Goode’s and Cramer’s testimonies are compared with another whistleblower, Michael Relfe, who was the first to claim having an experience of a “20 and back” tour of duty with a secret space program. Relfe described serving from 1976 to 1996, before being age regressed and time traveled back. His testimony first publicly appeared in 2000 in the two volume book, The Mars Records. Goode’s account of the age regression and time travel process for the “20 and back” program in the March 22 episode of Cosmic Disclosure offers additional information to what has been previously described by him and other whistleblowers. His most recent testimony is therefore very helpful in better understanding what appears to be the standard operating procedure used in secret space programs. Goode described the process at the end of a 20 year service term, they were first debriefed, made to sign non-disclosure agreements, and given assurances that they would be looked after once they returned. They were also promised many benefits such as scholarships, financial reimbursements, etc. Goode said that none of these promises made to him were kept. This is identical to the claims made by Relfe and Cramer regarding what they were promised before undergoing the age regression process. Goode described how he was physically immobilized for two weeks, while a variety of pharmaceutical products were used on him. 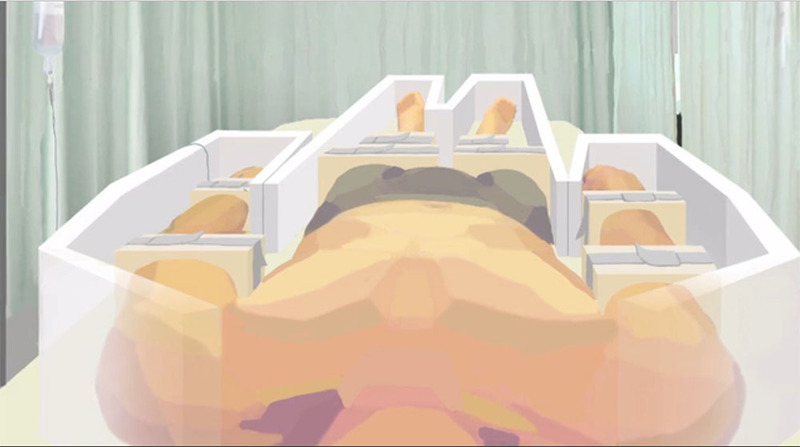 The Cosmic Disclosure episode provided an artistic depiction of how he looked while he was in this immobilized state. At the end of the two weeks, Goode described waking up feeling groggy, but now being 20 years younger. Significantly, when he awoke, his physical environment was completely different since he had been time traveled back 20 years, to when he first began his secret space program service. He describes then being again debriefed, having his memories wiped for the first time, and finally he had screen memories put in place. Goode was then transported back to only a few minutes after he was first taken in 1986, just before his 17th birthday. Goode said that people recruited to the “20 and back” tours of duty were either civilians as in his case, or serving members of the U.S. military, who have been covertly recruited during their normal military service. This is consistent with Relfe’s claim that in 1976 he enlisted in the U.S. Navy, and was then covertly recruited into a secret space program. Upon his return, after serving out his “20 and back” tour of duty, Relfe says that he next completed his six year service in the Navy, and was honorably discharged in 1982. Relfe has documentation to confirm his military service, but has not yet released this into the public arena. Goode described how upon his own return in 1986, from his “20 and back” service, he first woke up as a sixteen year old feeling confused, and then after several weeks, started regaining the bulk of his memories. Goode says that he was among a small group of people who the blank slating technologies simply didn’t work on, despite repeated efforts. In our April 2015 interview, he elaborated on why he decided to withhold telling others about his memories due to the chaos this would cause him, and the likely intervention of those covertly monitoring him. He described how others who regained their memories would either be re-abducted and put through the blank slating process again, intimidated into keeping silent, or eliminated. Goode says that for many others, who have completed the standard “20 and back” tours and subsequently undergone the blank slating process, they start to regain all of their memories after 20 years in “normal life” has elapsed. It is very significant here that both Relfe and Cramer, experienced “total recall” after 20 years had passed since their secret space program service. At this stage, it is worth asking what evidence exists to support Goode’s incredible claims about the existence of age regression technologies used for “20 and back” tours of duty? So far, we have the independent whistleblower testimony of two others, Relfe and Cramer, who claim that they experienced an almost identical process. In Insiders Reveal Secret Space Programs, I analyze their respective claims and conclude that there is no cross contamination of their testimonies, and that each is offering a truly independent account of what they recall had happened to them during their 20 year tours of duty. While their testimonies are compelling, and help to corroborate Goode’s recollections, it is fair to say that conclusive evidence has still not been found. 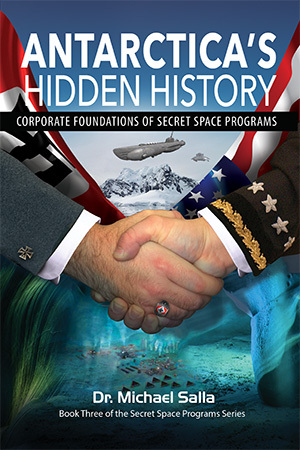 However, this situation appears to be changing with the emergence of the latest whistleblower testimony of William Tompkins, who has provided documentation to support his participation in a variety of U.S. Navy and aerospace corporate projects related to secret space programs. His book, Selected by Extraterrestrials, provides some of Tompkins documentation to back up his incredible claims. Significantly, in my private interviews with Tompkins, he has described the development of age regression technologies by one of the aerospace companies he worked with. 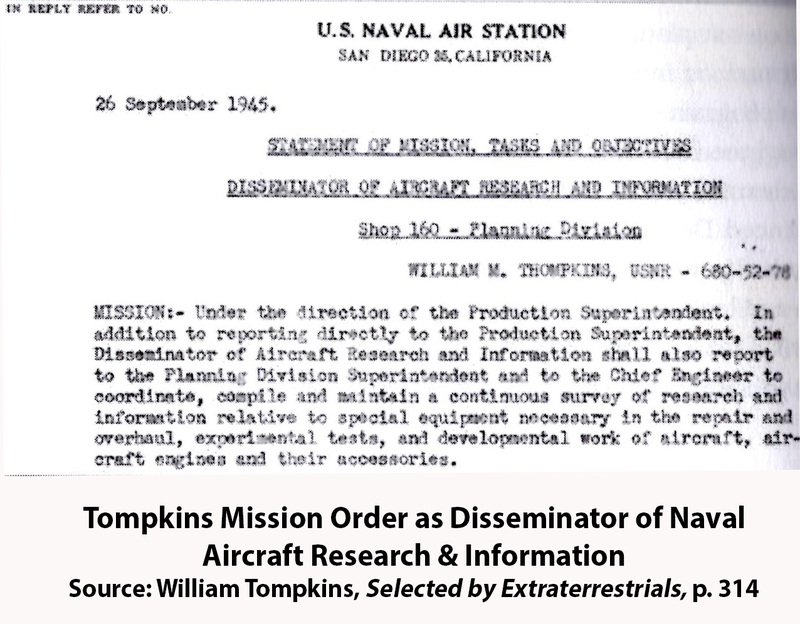 Tompkins says that while he worked with TRW from 1967 to 1971, they began developing age regression technologies based on information gained from Nordic extraterrestrial groups that were helping in the development of the U.S. Navy’s Solar Warden space program. Tompkins said he assisted TRW in developing age regression technologies, using his expertise in systems engineering to help coordinate the different groups and departments covertly involved in the project. Tompkins described these technologies as pharmaceutical in nature, which is consistent with the testimonies of Goode, Cramer and Relfe who state they underwent multiple injections of pharmaceutical products. Tompkins is presently writing about his experiences at TRW and its involvement in the development of age regression technologies in what will be the second volume of his autobiography. Significantly, TRW was taken over by Northrup Grumman in 2002, which is the corporation, according to Tompkins, primarily involved in building secret space carriers and battle groups today. Importantly, Northrup Grumman is now also involved in developing the age regression technologies for personnel recruited into secret space programs. According to Tompkins, age regression will be among a select group of technologies, including free energy and antigravity, which are planned to be publicly disclosed in the next few years due to a U.S. Navy sanctioned disclosure initiative dating back to 2001, if not earlier. Corey Goode’s latest Cosmic Disclosure episode is a detailed exposé of a range of technologies used for “20 and back” tours of duties. 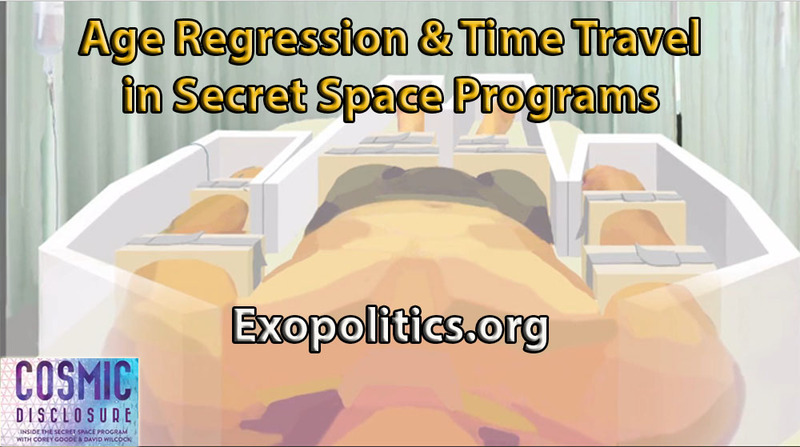 The corroborating support of both Relfe and Cramer’s prior whistleblower testimony reveals the standard operating procedure used for the application of age regression technology in secret space programs. Finally, Tompkins’ testimony casts significant light on the historical research and development of age regression technology, and of covert plans to soon release this previously highly classified information into the public arena.